It’s a sad fact that fantasy, science fiction, horror, the genres of pure imagination, have become so entrenched in conventions, expectations, and cliché that it’s rare to find a production that’s really something new. There’s only so many shambling zombie hordes, unstoppable knife-wielding maniacs, and feral yet seductive vampires one can watch before they all blend together into a indiscernible melange. But on the weekend, it was my honour to watch what felt very new. 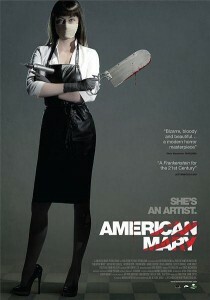 I watched American Mary, the second horror movie written and directed by Vancouver’s Soska Twins (Jen & Sylvia). Actually, I watched it twice. It’s the story of Mary Mason, an impoverished medical student who takes on some questionable surgical jobs to pay the bills and then gets embroiled in the body modification subculture, using her surgical skills to help people look on the outside how they feel on the inside. She also uses her skills to achieve revenge on the one who wronged her, a vengeance as creative as it is horrific. American Mary is a powerful production that reminds me a little of Company of Wolves for its imaginative execution, graphic imagery, and decidedly female perspective and a little of David Chronenberg and Clive Barker for its unrelenting body horror and psychological breakdown but is still very much its own beast, a fascinating exploration of terror, desperation, betrayal, and the strange transmutations people undergo for self-expression. Two things in particular make the movie stand-out. One is the depth it explores the main character’s psyche, making her pain very sympathetic and her fall into brutality very plausible. The other is the movie’s decision to use, as the story’s backdrop, the body modification community, people who undergo surgery to give themselves split tongues, horns, fangs, and other transformations. I always find explorations of strange subcultures fascinating and the movie manages to walk the line of treating the subculture with sympathy and respect while still using it to evoke strangeness and horror. A stripper who makes her body emulate classic cartoon character Betty Boop, a woman with the features and anatomy of a Barbie doll, twins who enhance their mutual physical bond while giving themselves the forms of devils, and of course the once-human thing that Mary herself works her will upon form a menagerie of the bizarre, the surreal, the very disquieting. American Mary opens up a new world of horror, one filled with depth and terror, and is highly recommended for any aficionados who are looking for something fresh and new. Though it is certainly not for the squeamish. This entry was posted in Review and tagged American Mary, horror movie, Jen Soska, review, Sylvia Soska. Bookmark the permalink.